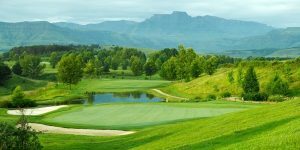 Set high amongst the picturesque peak of the Central Drakensberg lays the Champagne Sports Resort Golf Course. Absolutely littered with breath takingly beautiful view of the surrounding mountains and in particular, the Cathkin and Champagne peaks, it comes as no surprise that the Top 30 course has been voted South Africa’s most beautiful (in recent years.) Putting in the effort where it counts is a priority for the Resort and this is, possibly, most evident in that the club’s 19th hole is ranked 5th in the country! Champagne has sculpted a true championship course out of the rolling landscape and the eighteen holes have been magnificently woven together with immaculate kikuyu fairways, bent-grass greens, devastatingly well placed bunkers (84 of them) and water hazards to provoke a true challenge. The generous fairways are bordered by light rough but beware that badly wayward shots are going to be punished here. The signature hole belongs to the 1st – a sheer brute force affair with the tee-off standing higher than the clubhouse and at 605m in length, the longest hole in the country, and takes you across a ravine to boot! 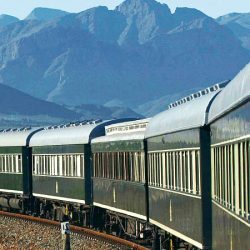 Facilities are top-drawer and visitors are warmly welcomed.